Behind every amazing record is an equally amazing recording studio. Even the most talented musicians can fall victim to shoddy recordings, so a band's decision on where to lay down, mix and master their material can make a world of difference to how they're perceived by listeners. - Gravity Studios (2250 W. North Ave., Chicago) – Wicker Park’s Gravity Studios has developed a reputation as one of the best studios in Chicagoland, and for good reason. Since 1993, artists such as The Smashing Pumpkins, Umphrey’s McGee, The Walkmen, Veruca Salt, The Sounds, Ben Kweller and Silversun Pickups have produced noteworthy recordings with the studio’s help. The studio is not only a viable option for widely-known bands, though. Up-and-coming local acts such as My My My and Mr. Russia have also turned to Gravity and have achieved excellent results. To learn more, visit the studio's site for an in-depth look at its history and capabilities. - Soma Electronic Music Studios (2001 W Division St., Chicago) –Scan the client list of Soma Studios - owned and operated by engineer John McEntire - and you’ll find an impressive list of bands, including Spoon, Bright Eyes, Stereolab, Chin Up Chin Up, Tortoise, Wilco, Fiery Furnaces, The Sea and the Cake and many more. Visit them online for detailed information on rates as well as the studio's noteworthy recording equipment, which includes a newly refurbished Trident A-Range console - one of only 13 in the world. 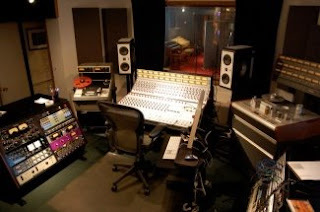 - Gallery of Carpet Recording (Villa Park) – Villa Park’s Gallery of Carpet was established in 2002 by producer Brian Zieske and has consistently helped up-and-coming indie bands produce outstanding, professional quality recordings. Local acts such The Academy Is, The Hush Sound, Pet Lions, the Rikters and Bailiff are just a few examples. In a 2007 Illinois Entertainer article, GOC client and The Long Gone Lonesome Boys leader John Milne described Zieske as a “wunderkind.” “In terms of being an in-studio genius Brian’s right there,” Milne said in the article. “But he’s not smug or arrogant. I suggested some really unusual ways of working, and although he expressed doubts, he was willing to try things and recognized what worked.” The studio’s Web site offers a hefty amount of information on its capabilities, gear and rates, and this recent Gapers Block interview with Zieske sheds light on GOC’s history and its owner’s approach to recording. Virtual Studio has all the required live media processing facilities to ensure successful completion of projects on time and within budgets. Its facilities includes: Talk shows hosting, using virtual sets; live & on-demand web-cast streaming studio; recording by voiceover artists; production facility for audio video presentations; option for live call outs or live phone-ins; radio shows; panel discussions; training-educational videos with software demos audio-video processing, optimization & encoding facility. All this with 100% power backup; multiple connectivity for live web-casts; online project management system. @anon: Ditto. Anon refers to Mr Albini's Electrical Audio in case yr wondering. Dont forget about Dungeon of Noise Studio (www.DungeonOfNoise.com) on the near Southwest side. The studio has the Best, and Newest, Solid State Logic Recording Console (9056J) in the MIDWEST! Some past clients include Urge Overkill and appearances on the Recent Methods of Mayhem record with Tommy Lee Of motley Crue Fame. The studio is one of the oldest builds in the Midwest (1975). Keep in mind in a study by Billboard that 93% of ALL no. 1 hits made on SSL 4000 and 9000 consoles! So if you want to be the best you're going to need the best Pro Tools available! How does Electrical Audio or Strobe Recording not make this list? this list is NOT ACURATE... While these are great studios, many of the studios on lake (studio row) are not even mentioned.. CRC, Pressure Point, Paragon, etc. There are also many hole in the wall studios with advanced equipment owned by artists such as R. kelly, Percy Bady and even Kanye West that you have to know somebody to get in.. Don't believe the hype of this post. Chicago is known for great studios... Enough to fit any flavor or level of comfortability with the engineer or equipment to get a supremely solid recording. any noteworthy r and b recording studios in Chicago?